Work for social change is long, slow work; but, according to Jay Smooth, veteran hip-hop DJ, cultural commentator, and videoblogger, it’s some of the most meaningful work we can do. “We plant seeds and contribute to the environment of ideas,” said Smooth, as he opened a day of talks and workshops during the April 9, 2017, symposium, “Stand Up! 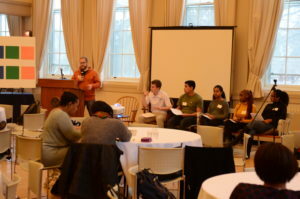 Student Activism at Independent Schools,” which took place at Phillips Academy Andover and was hosted by the Academy’s Office of Community and Multicultural Development (CAMD). Those seeds, he said, can one day reap great benefits if a community comes together to help them grow. 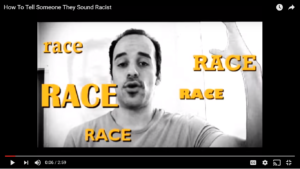 In his video, “How To Tell People They Sound Racist,” Smooth suggests that a conversation about a racist remark or action should be focused on what the racist-sounding person did, not what or who they are. Smooth, the son of a white Jewish mother and a black father, grew up in New York City, and attended Ethical Culture Fieldston School. He started his career at WBAI Radio, where he founded New York’s longest running hip-hop radio show, the Underground Railroad. Best known for his social commentary in his illdoctrine.com video series, his video, “How to Tell Someone They Sound Racist,” has become part of the curriculum in a number of schools and universities and has been viewed millions of times around the world. As plenary speaker, Smooth focused his remarks primarily on how to deal with issues of racism. 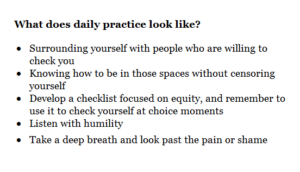 Using a dental hygiene analogy, he suggested that we need to cultivate an understanding that being a good person is not a fixed, immutable state. There’s an incorrect understanding, said Smooth, that bad people are racist and good people would never be. Calling someone racist, he said, is akin to calling someone a bad person and will immediately call up defense mechanisms. Smooth suggested that we should instead carefully focus on calling out the action and not what the person is. “We are all striving to be good, but are prone to gaps in our knowledge of another person’s experiences,” said Smooth. There needs to be a crucial shift, he said, toward understanding that working toward goodness is a practice and not a status you achieve. It’s collective work, internal work, and doesn’t have a finish line. Most importantly it’s important to encourage action—to help the next generation to persevere, to know it’s worth showing up, to know it’s worth taking risks, and to build a community or broad coalition to help do the work. Adults and institutions need to model these principles. Remembering a scene from Mad Men, where Betty Draper is watching scenes of riot and protest on the evening news with the family’s black maid, Smooth explained how Draper turned to her maid and suggested that maybe now is not the time to push for her progress and equality. In the workshop, “I’m So White, So What?” Berkeley L. Gillentine, associate dean of academics and a dormitory head at Cushing Academy, discussed the concept of “being white” and how to encourage white adults and white students to stand up in their communities as allies, since white people are quite often the majority population in independent schools. She said that, for some people, it’s easier to notice racism and privilege in others but it’s harder to self-notice. Sharing a personal story, Gillentine explained how she realized she had to face some of her own implicit biases. She described how she had mixed up the mothers of two African-American students in the dorm she oversees. These were families she knew well and parents who entrusted her to care for their children in the dorm’s home-like environment. But Gillentine said she carried on to the wrong mother about another daughter’s accomplishments and how much she adored the girl, before the mother stopped her. It was a pivotal moment for Gillentine, in recognizing that she, even as a school leader who worked with kids from diverse backgrounds every day, had blind spots. Gillentine said a first step in educating young people is to pause and observe how they interact with and understand race. She said microaggressions—a subtle or unintentional discrimination against a member of a minority group—happen on campus every day, but it’s important to challenge those moments and encourage students to do so as well. This is not just the work of a school’s director of diversity or of minority groups, who fight this battle every day. Two other workshops focused on concrete examples of how independent schools are integrating critical thinking about social issues into their curricula. James J. Greenwood, currently director of inclusion and multicultural practice at the Shady Hill School, worked with faculty in his former position at Northfield Mount Hermon to develop a required diversity and social justice course, even though few secondary schools offer such a course–and even less hold it as a graduation requirement. Another workshop later in the day featured a panel of five students and the teacher, David Fox, instructor in English and art history, who took part in a new course at Phillips Academy, “Youth from Every Quarter.” During the course, students and Fox worked together to interrogate words from the Constitution of Phillips Academy, a school that “shall be every equally open to Youth, of requisite qualifications, from every quarter.” The panel shared a number of difficult questions they probed in class, including how they came to understand issues of effort, merit, and privilege, and of inclusion and exclusion at PA; the extent to which they are living their values; and what types of work can be done to dismantle structures and systems of oppression. When the students were asked by an audience member about how they might one day work to address issues of inequality and increase access to independent schools like PA, one of the students, Lydia Fikru ‘17, responded promptly. 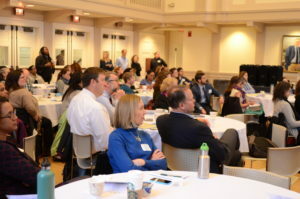 To learn more about Andover’s Equity & Inclusion pillar of the Strategic Plan, please visit http://sp2014.andover.edu/strategicpriorities/.